Although scientists still see huge potential, cautious retailers and lengthy regulatory delays have made investors skittish. WASHINGTON — Don’t expect to find genetically modified salmon — or any other engineered fish or meat — on store shelves anytime soon. The Obama administration has stalled for more than four years on deciding whether to approve a fast-growing salmon that would be the first genetically modified animal approved for human consumption. During that time, opponents of the technology have taken advantage of increasing consumer concern about genetically modified foods and have urged several major retailers not to sell it. So far, two of the nation’s biggest grocers, Safeway and Kroger, have pledged to keep the salmon off their shelves if it is approved. 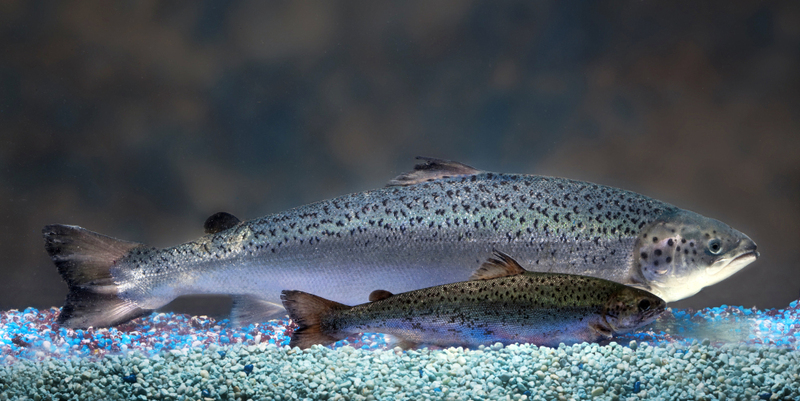 Supporters of genetically engineered fish and meat say they expect Food and Drug Administration approval of the salmon and still hope to find a market for it. However, the retailers’ caution and lengthy regulatory delays have made investors skittish. By altering genetic materials of animals, scientists have proposed — and in some cases actually created — animals that would be bred to be free of diseases, be cleaner in their environments or grow more efficiently. Think chickens bred to resist avian flu, “enviropigs” whose manure doesn’t pollute as much or cattle bred without horns so they don’t have to be taken off during slaughter. But where the scientists see huge opportunity, critics see a food supply placed at risk. They say modified organisms can escape into the wild or mingle with native species, with unknown effects. There is no evidence that the foods would be unsafe, but for some, it is an ethical issue. Archer says people have a greater “visceral response” to eating modified fish and meat than they do engineered crops, which are already fully integrated into the food supply. Ron Stotish, AquaBounty’s CEO, says the company has already spent $77 million on its AquaAdvantage salmon, which has an added gene from the Pacific Chinook salmon that enables the salmon to produce more growth hormone, allowing it to grow faster. AquaBounty executives say there are several safeguards designed to prevent the fish from escaping and breeding with wild salmon. Still, opponents call it “Frankenfish” and say not enough is known about it. The FDA won’t say how many applications are in line behind the salmon. But given AquaBounty’s long road, other projects have remained on the shelf or moved to other countries. James Murray, a professor of animal sciences at the University of California at Davis, has genetically modified goats that produce milk designed to fight childhood diarrhea in poor nations. He moved his project to Brazil, where he says the regulatory environment is friendlier and the government is funding some of his research. “You can’t get funding in this country because you can’t get regulation,” Murray says. Similarly, Canadian researchers have said they won’t pursue the “enviropig” in the United States after investors raised concerns about the length of the FDA review process. Another project backed by the Minnesota-based company Recombinetics would genetically modify cattle to be born without horns so they would not have to be removed during slaughter, an efficiency for meatpackers. Recombinetics CEO Scott Fahrenkrug says the project is in a holding pattern as investors eye the lengthy salmon approval process, but he says technologies like his will be necessary as global population is set to increase. The company is now developing engineered products for the medical market, but Fahrenkrug says they hope to produce cattle for meat. “The agriculture market is huge, and that’s where we want to be,” he says. If the salmon are approved, it still would take about two years to get them to market — if anyone will sell them. Although some of the biggest grocery chains have pledged not to, one major retailer has not weighed in — Wal-Mart, the nation’s largest grocer. Opponents are aggressively lobbying the company to keep it off shelves. The fish is not expected to be labeled as genetically modified under FDA guidelines, so if retailers do sell it, consumers wouldn’t know if they are buying it. AquaBounty’s CEO says he’s holding out hope for approval.